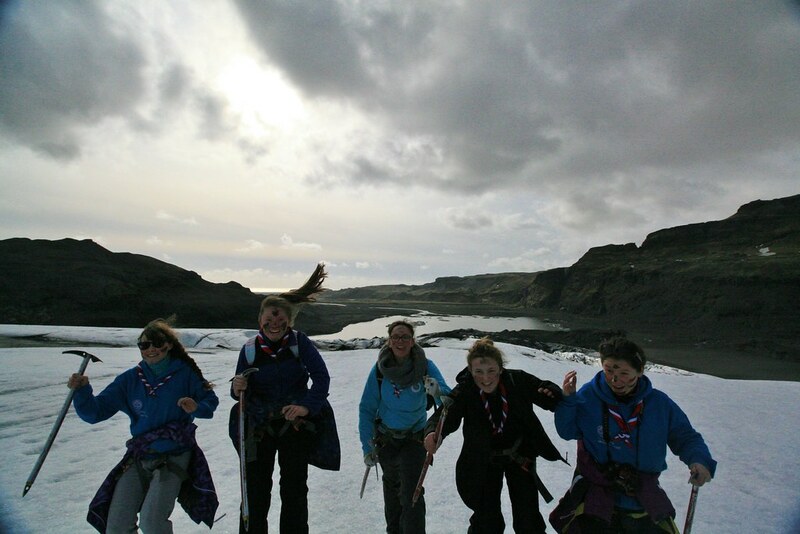 14 adventure-loving members of Girlguiding Middlesex East visited Iceland for a week during the Easter break. We had an amazing time and had so many brilliant experiences, but the day we hiked on a glacier was probably my favourite. 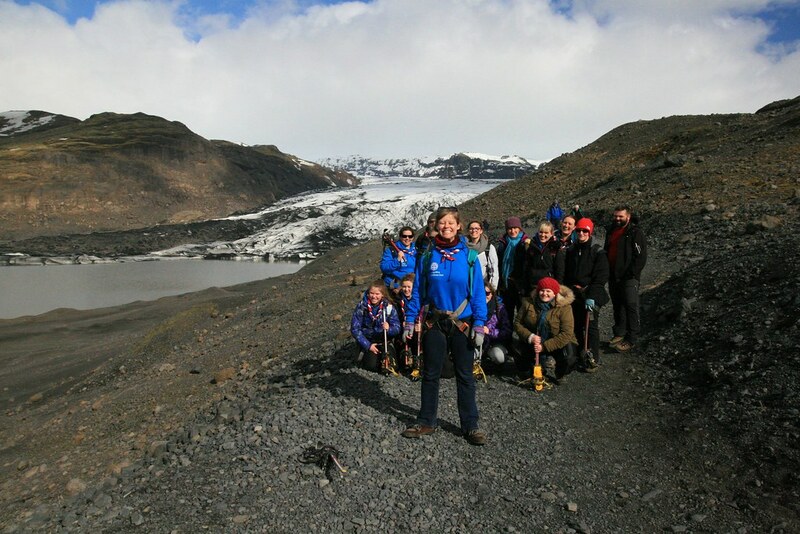 This is the story of our glacial adventure, and Senior Section member Louise has shared her memories below too. The Glacier was a couple of hours away from our campsite, and yet somehow even the journey there was magical. You can't help but love a country where you can spot volcanoes out of the window, where snowy mountain peaks glimmer around you and cliffs and rocks arch in formation down into the sparkling sea. 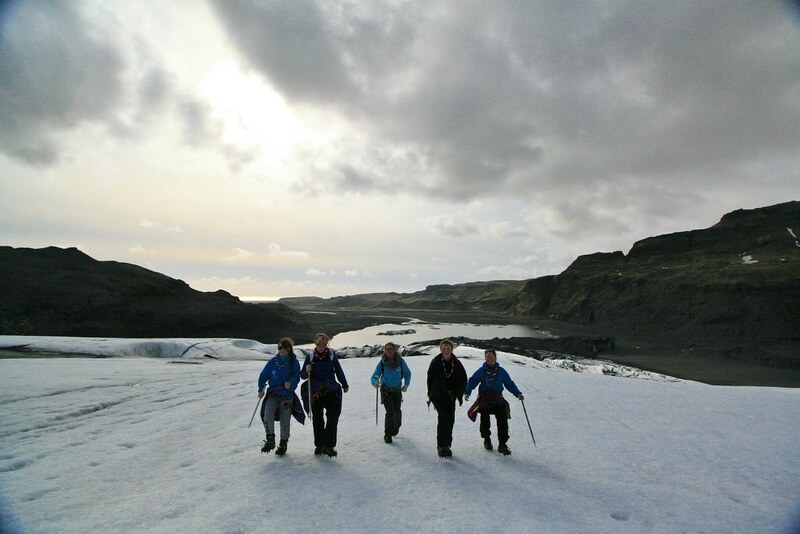 We were so lucky with the weather: our glacier expedition had originally been planned for earlier in the week, but storms and gales caused all activity on the glacier to shut down to keep everyone safe. So our wonderful hosts simply rearranged our schedule and we went later in the week in glorious (slightly chilly) sunshine! 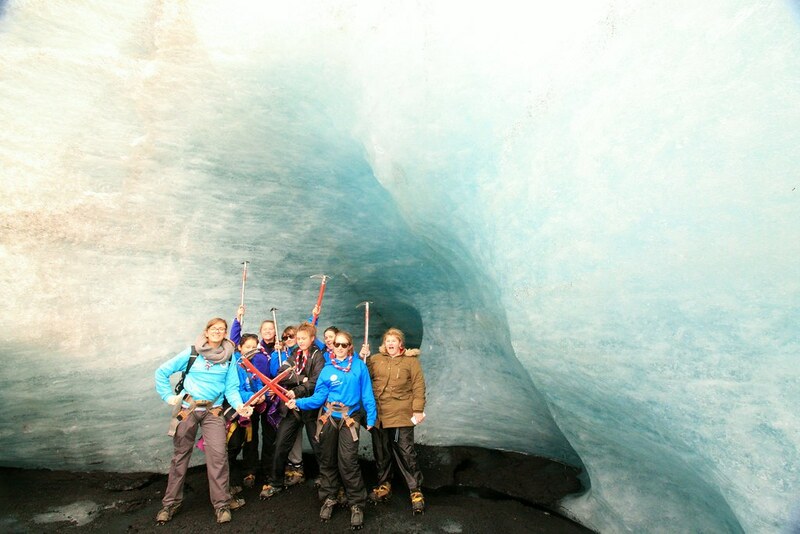 We arrived near the base of one of the tongues of the Sólheimajökull Glacier. In reality, the glacier is big. Very big. Like, I mean HUGE. I'm not sure you're getting it, so however big you're thinking, multiply it up, add 6, and square your answer. Everything you see in these pictures is just the tip of the iceberg (pun intended); it's the equivalent of hiking on a little tributary of a giant river. Except that the river is made of ice. I demanded the obligatory pre-activity photo of the group, and got my camera all poised. However, our friendly guides thought that I might like to be in the photo too. Obviously that was a very good idea and the composition of the image was much improved by my standing in it. Although not everyone agreed. 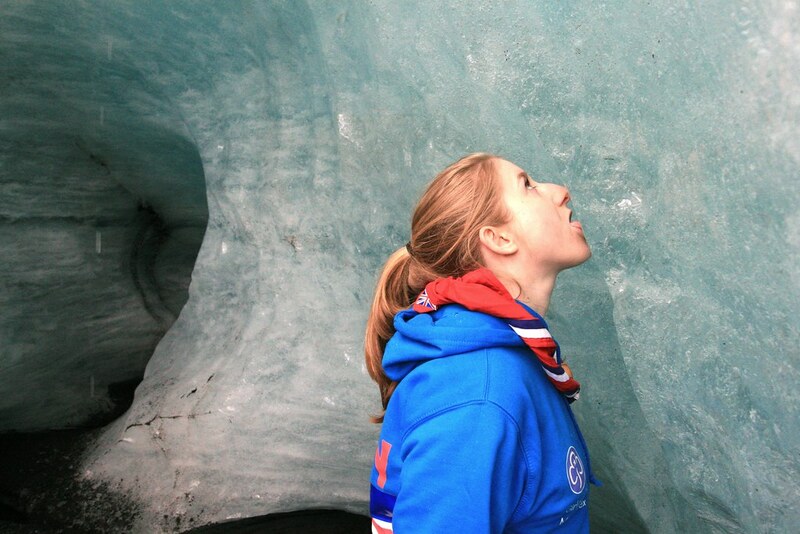 We had by two guides on our hike, Octovia and Grimur, who knew the glacier inside out. 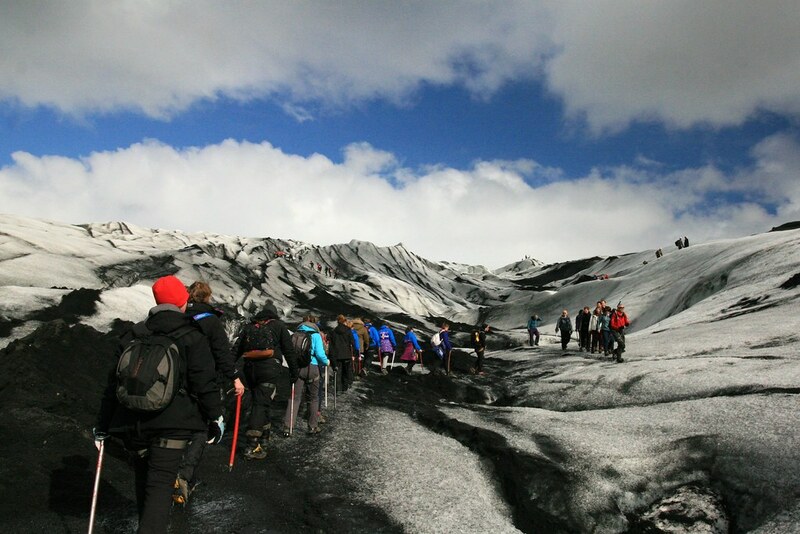 They kitted us out and we walked the 15 minutes along the banks of the lake until we reached the glacier's tongue. Due to climate change, the glacier is retreating at a surprising rate and Octovia pointed out a little flag to us in the middle of the lake. The flag marks where the glacier used to begin just a few short years ago. Once we reached the ice, we stopped to make sure we were fully prepared. Octovia gave us a lesson in fitting our crampons: metal plates that strap to the bottom of your shoes with spikes that dig into the ice and help you grip. They were incredibly effective, and meant we could stroll up and down steep, icy banks with relative ease, and all the false confidence of someone wearing metal shoes made of spikes. We weren't sure what the ice picks were for, and Octovia told us quite seriously that we could use them to help us walk if we wanted, but mostly people just like to carry them around and pose for cool photos. Out on the ice, we were expecting good views, and an exciting hike, but I don't think we anticipated how much we would learn. 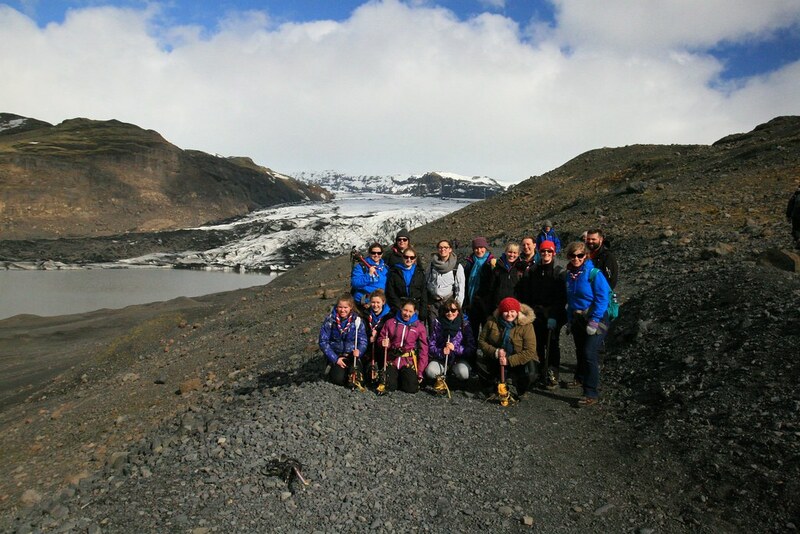 Our guides were brilliant: patient, enthusiastic and willing to answer any questions we could throw at them, and both were clearly very passionate about the glacier and the surrounding environmental issues. The glacier is moving, albeit slowly, as it continually melts and freezes in a cycle, the tongue reaching out to form a lake which ambles its way serenely to the ocean. Octovia explained that the glacier forges a large canyon for itself, and fills the space it erodes. 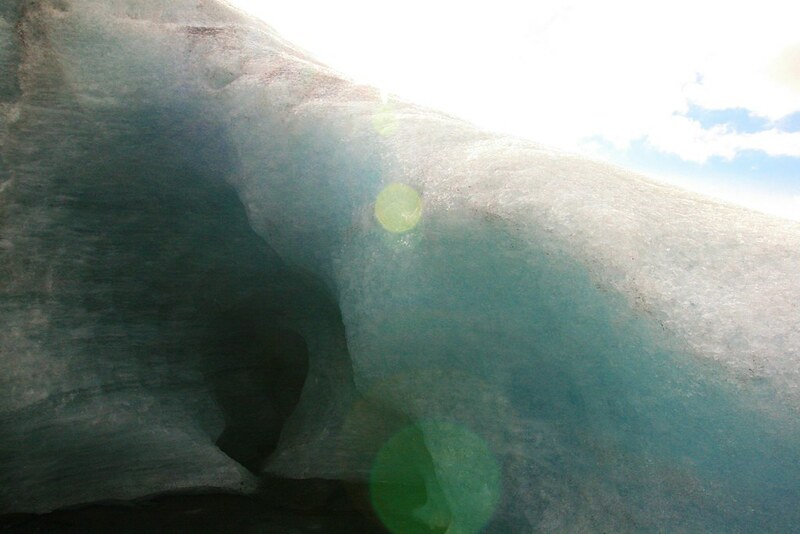 As it widens, large cracks and crevasses open up in the glacier that can go deep down into the ice. Me: Do they mine in the ice? Me: What are they mining for? I abandoned this line of questioning. 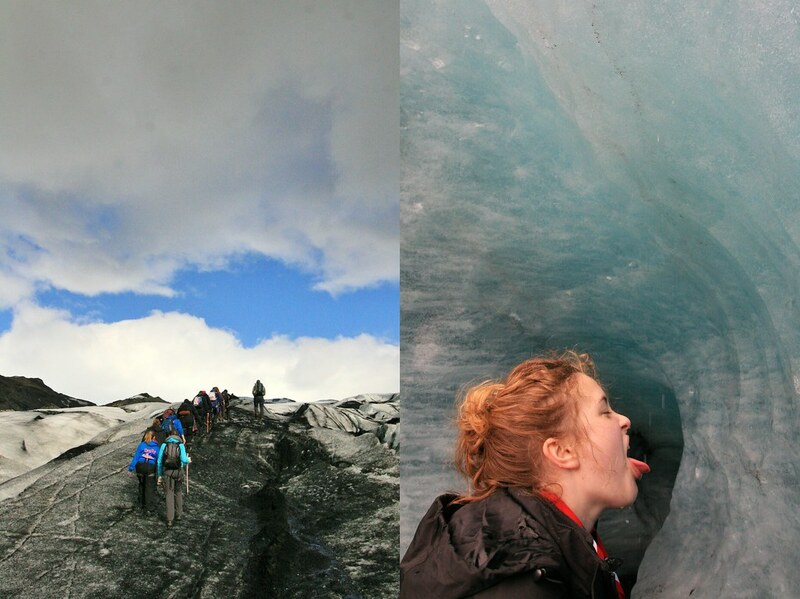 So we had a go at licking the glacier. The trick is to find a nice clean patch, but the taste is fresh, wonderful and delicious! 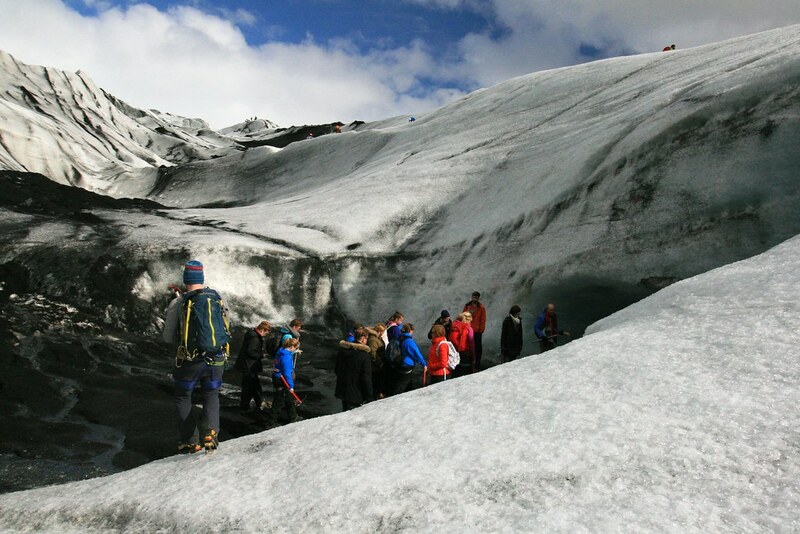 As we climbed higher onto the Glacier, the girls wanted to know why it looks black in places. It's not dirt, as you might think: its volcanic ash. Octovia proved to be a volcanic-ash enthusiast: when volcanoes errupt (like the infamous eruption in 2010 which closed lots of airports) black ash is spread far and wide, and settles in a layer over the glacier. If the layer of ash is thin, it absorbs sunlight and makes the glacier melt more quickly. However, if the layer is thick enough, the warming effect never reaches the glacier and instead the ice is insulated and melts more slowly. The ash also fills crevasses and is washed into them. 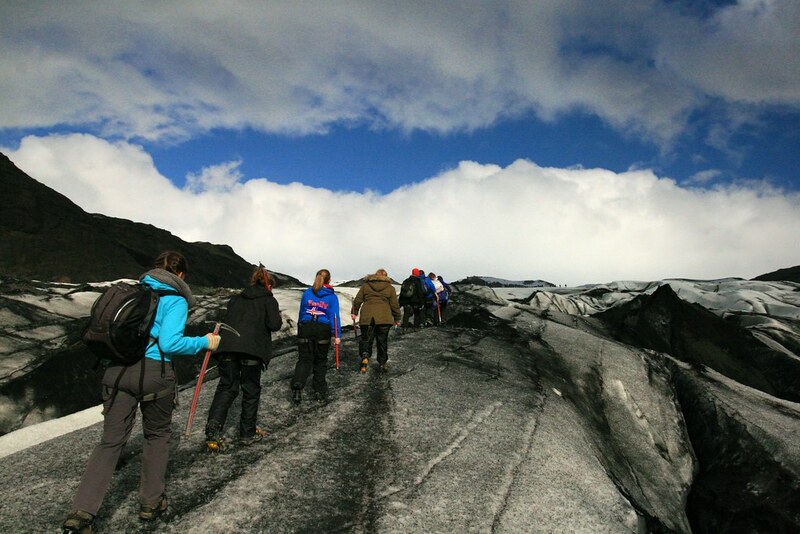 However, as the ice melts, the ash in the crevasses is revealed and appears in long streaks down the glacier. Until it rains or the ash is washed away and the process begins again. It's a continuous cycle. Octovia then shared her favourite kind of ash with us; I've never met anyone before who had a favourite kind of ash. This kind had a strange consistency. Squeeze a handful of the stuff and it feels hard and powdery. However, if you then let it rest in the palm of your hand, and shake it a little, it becomes liquidy and runs between your fingers. Or all over the faces of your Senior Section group! You might just be able to make out the sea in the distance: this is a southward view and if you travel in a straight line south from this point, you would cross the Atlantic Ocean and the first land you would reach would be Antarctica. But first you'd have to get around the fearless and savage Girl Guides of Middlesex East with their faces daubed with ash, their sharp, spiky shoes, and their threatening props...I mean ice picks. And that war cry you hear? Actually they're just belting out a bit of Frozen. P.S. I'll be posting about our different aspects of our trip over the next few weeks. You can read about our day trip to Reykjavik here.